We have seen that Yeats and other writers were reading the works of neoPlatonist philosophers in the early 20th century, but what about the rest of the public? The fact that the Irish Independent (24th February, 1910) decided to publish the article reproduced below suggests that there was some interest in philosophy, at least in relation to the debate on the role of women. Padraig Colum was part of the Irish Literary Revival, and would also have been familiar with student discussion around UCD, and perhaps that of clerks in the city. Female Emancipation was news – the suffragettes feature in many other Irish Independent stories. All the same, Nietzsche is only mentioned 36 times in the Irish and Sunday Independent in the 40 years to the end of 1945, so general interest was limited at best. That is not to say this philosophy was not influential. In one of pieces between 1905 and 1945, the philosopher is credited by TG. Kelleher (The Irish Theatre Movement, January 06, 1929) for “putting the Irish dramatic movement on its feet, for Yeats, its dominant force, was at that time under his thumb.” In another (Unfamiliar Shaw, Tiresome Eloquence, June 09, 1928), the writer notes that people no longer find Nietzsche as fascinating as they did eighteen years ago. Nietzsche may, then, have peaked in his popularity as Colum wrote this article. 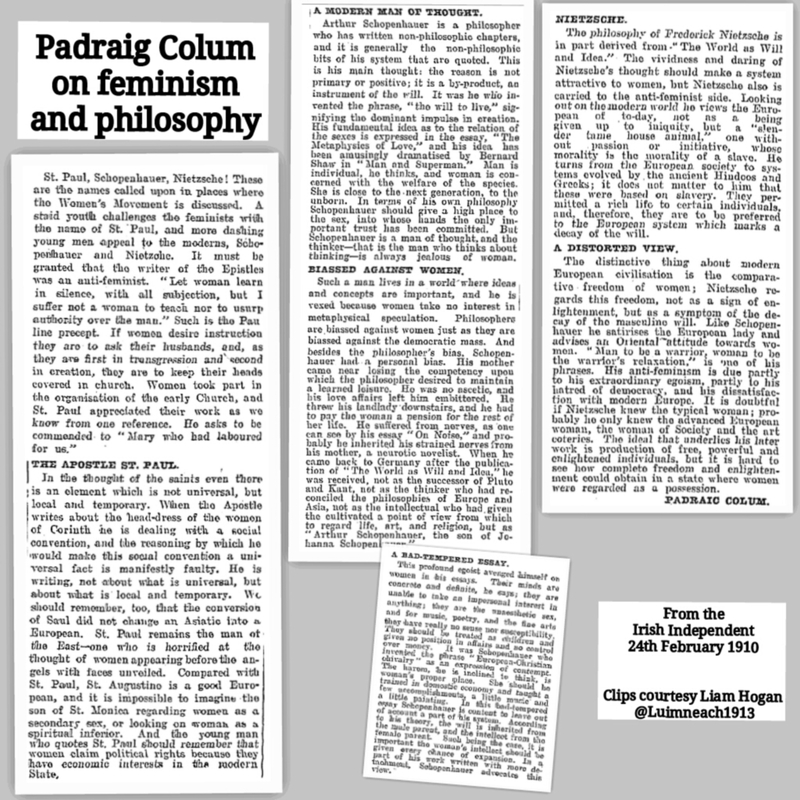 In the piece Colum answered those who invoke St Paul, Schopenhauer and Nietzsche against feminists and female equality. He argues that Paul is speaking from local circumstance rather than from universal truth. The Saul that became Paul retained his previous attitudes about women, even as he acknowledged their work in his letters. Schopenhauer, Colum points out, writes both philosophic and non-philosophic chapters, with the latter most often being quoted. Schopenhauer’s idea that man is individual and woman is concerned with the welfare of the species should, if Schopenhauer is consistent with the terms of his philosophy, mean a high place for women “into whose hands the only important trust has been committed.” In addition, Schopenhauer suggests the will comes from the male parent and the intellect from the female, which again would support an argument for allowing every chance for the expansion of women’s intellect. When writing in detached mode, Schopenhauer takes this view, says Colum, but in the passages where Schopenhauer advocates treating women as children he is exercising his personal and professional bias against women. Eight years after this column was printed, women voted in elections for the first time. In the meantime Ireland and Europe had both changed utterly, and Colum was living in the United States. The full column is below, courtesy of Liam Hogan. Click the picture to enlarge it.